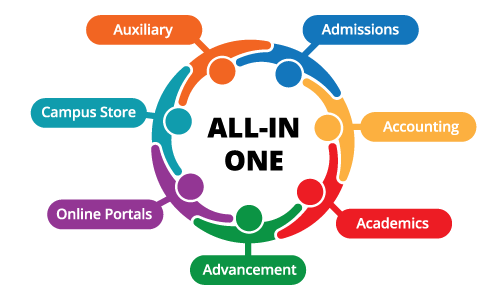 Drive Fundraising and Manage Constituents for Your Alumni Office with the Ascendance Advancement Module. The Advancement team needs dynamic and accurate information about constituents, ranging from basic biographical or corporate details to detailed giving history, relationships, and customized greetings. That’s a start, but it’s not enough: you also need sophisticated features like prospect management, appeals and solicitation tracking, and a full set of robust and functional mailing and relationship management tools. The system needs to record and track every detail about gifts, pledges, and payments. We know you require extensive reporting and data export capabilities too, like the flexibility to analyze data by constituent or by household. Finally, you need a system without bottlenecks: it has to be completely integrated with your student information system and your accounting software. Learn more about our Ascendance Alumni Developement module and its add-ons by downloading the product sheet. ✓ Define and track an unlimited number of funds, campaigns and appeals. ✓ Maintain and access deep constituent data: biographical details, addresses, customized greetings and giving history, solicitors, appeals, relationships, and more. ✓ Collate and segment records: constituents and spouses are recorded as a household, but discrete records for each individuals are kept for flexible reporting and analysis. ✓ Efficiently record and process gifts, pledges and payments, including thank-you letters and receipts. ✓ Sophisticated tools for prospect management. ✓ Mailing functions that include the ability to use National Change of Address processing for verification and standardization of mailing addresses, resulting in mailing savings. ✓ Extensive report and export tools, including re-usable and optionally shared report templates, easy management of operational reports, and integration with Crystal Reports for customized reports that fit your unique needs. ✓ Deep integration with the Registrar module facilitates creation of constituent records directly from student and parent data.